Whoa! Kylie Jenner looks TOTALLY different in this latest selfie! Kylie Jenner has sent Instagram into meltdown as she looks unrecognisable in her latest selfie! But is there more than meets the eye?! Mirror mirror on the wall, who looks nothing like themselves at all?… KYLIE, IS THAT YOU?! Whilst we are all pretty well accustomed to Kylie Jenner regularly switching up her look (which often ends in us thinking we can rock coloured hair, damn it *flicks green extension*), the latest selfie from the teen has literally left us scooping our jaws off the floor. The 18-year-old is completely unrecognisable in a recent Instagram, which she has captioned ‘Looking BOMB in my InvisiWeftTM Hair Extension line with @bellamihair…’. Looking like a hybrid of Kylie and Ariana Grande, with an added dash of a Cara Delevigne eyebrow, Instagram has gone into meltdown over this mysterious face adjustment. Comments are of the general nature of, ‘IS THIS KYLIE ????????!!!?’. We couldn’t have worded it any better ourselves, miscellaneous Instagram user. But lo and behold, the plot thickens! Like a modern day Sherlock Holmes (If old Locky was interested in green hair extensions and Ariana Grande and looking at David Beckham‘s face), we bring deeper meaning to this post. In an attempt to decode the caption, we bring a possible dual meaning…Kylie has a line of hair extensions with Bellami, the company tagged in the snap. Therefore it is very possible she is saying that the person in the selfie is looking amazing in the extensions, not herself. This would mean the post is less of an incredible feat to the power of make-up and more a shameless bit of self promotion. Not that we’re judging- if we had a line of hair extensions, best believe everyone from your mum to your cats best cat friend would know about it. So what do you reckon?! 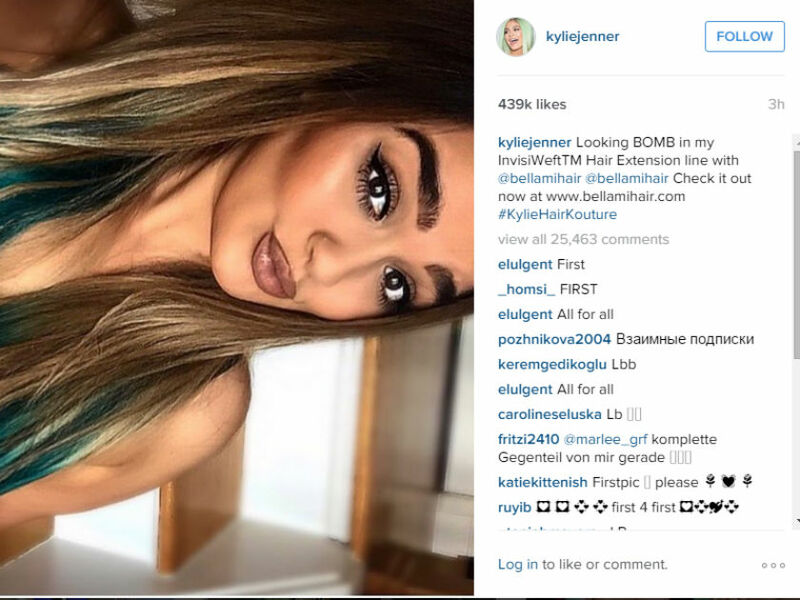 Kylie and Kylie‘s new face or a hamless bit of self promotion?